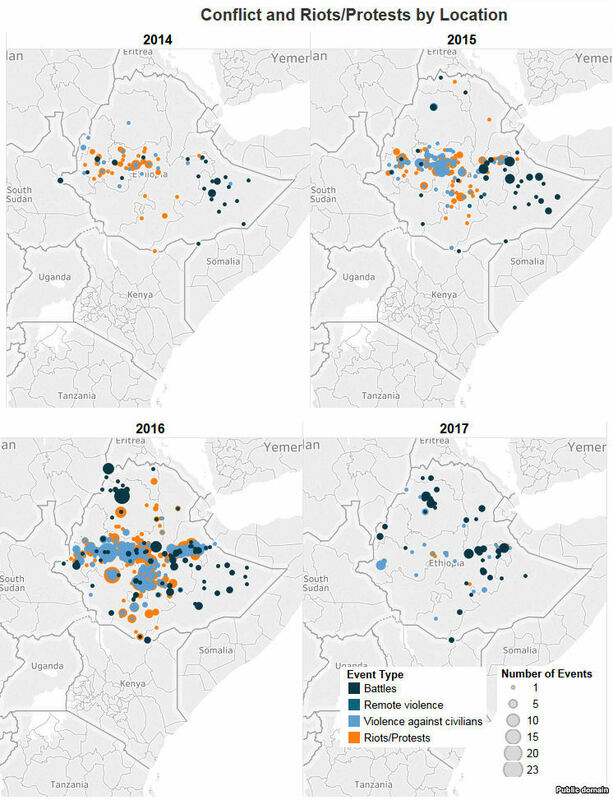 By the end of 2017 ethnic violence was worsening in Ethiopia. From Oromia to Amhara regional states, huge anti-government protests were witnessed against what protesters called political and economic marginalization. To make matters worse more than 60 people were also recently killed caused by clashes between the Oromos and Ethio-Somalis. Ethiopia has more than 80 ethnic groups, of which the Oromo, at approximately 35-40 percent of the population, is the largest. The federal system drew boundaries approximately along major ethnic group lines. The Oromo, who constitute about 40 percent of the population, are half Orthodox Christians and half Muslims whose traditional alliance with the Amhara in Shewa included participation in public administration and the military. The Oromiya region was established when the new government came to power in 1991. The federal system was divided along ethnic lines. The Oromos are the largest ethnic group in the country. A long history of censorship of the Oromo by various ruling elites has made censorship one of the major features of Oromo social and aesthetic processes. Not until the fall of Haile Selassie were the voices of other histories and previously peripheral groups given a chance to participate in the dialogue of Ethiopian statehood. Starting about the mid-sixteenth century, the Oromo people, migrating from the southwest, gradually forced their way into the kingdom, most often by warfare. The Oromo, who eventually constituted about 40 percent of Ethiopia's population, possessed their own culture, religion, and political institutions. As the largest national group in Ethiopia, the Oromo significantly influenced the course of the country's history by becoming part of the royal family and the nobility and by joining the army or the imperial government. During the seventeenth and eighteenth centuries, religious and regional rivalries gradually weakened the imperial state until it was little more than a collection of independent and competing fiefdoms. The Oromo occupy areas in south and central Ethiopia that only became part of modern Ethiopia during the late nineteenth and early twentieth centuries. The people in these areas largely became tenants on their own land as the empire consolidated its rule. Many Oromo resented the alien rule of Amhara and Tigray from the highland core of the empire. Haile Selassie tried to win Oromo loyalty by developing alliances with key Oromo leaders. Although this strategy enabled the emperor to co-opt many Oromo into the imperial system, it failed to end Oromo resistance. Examples of this opposition to Addis Ababa included the Azebo-Raya revolt of 1928-30; the 1936 Oromo Independence Movement; and the establishment in 1965 of the Mecha-Tulema, an Oromo self-help organization. From 1964 to 1970, a revolt in Bale presented the most serious challenge to the Ethiopian government. 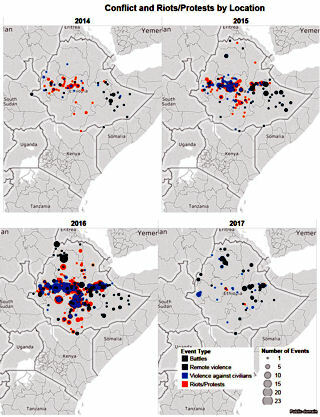 During that time, separate Oromo rebel groups in Bale conducted hit-and-run raids against military garrisons and police stations. Until 1969 the Somali government provided military assistance to these rebels as part of its strategy of reestablishing a "Greater Somalia." In addition, Oromo rebels attempted to coordinate their military activities with the Western Somali Liberation Front. After Mahammad Siad Barre took over the Somali government in 1969, the Oromo rebels lost Somali support and found it impossible to sustain their campaigns in southeastern Ethiopia. In 1970 the rebels agreed to a truce with the Haile Selassie regime.